On every light post and power pole in my neighbourhood there is a laminated poster. 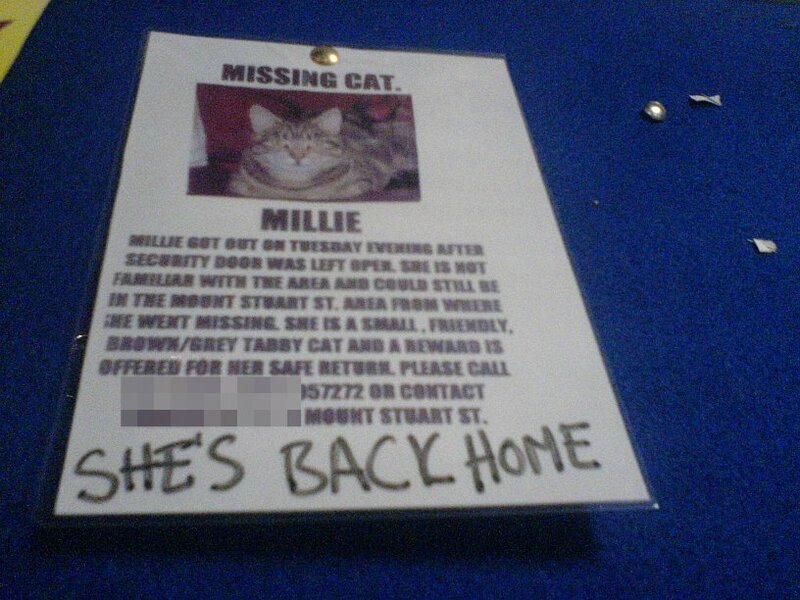 “Missing Cat” is the headline with a photo of a golden-eyed feline cut-and-pasted beneath. He answers to the name Megatron, according to the description. He is trusting and loving and has never been outside before. If found, please return to the below address. I see posters just like this one all the time. Sometimes they are advertising lost dogs, but for the most part it is a beloved cat that has gone astray. Most often, they appear after big storm surges, like the one we had last night. They always cause my steps to slow. Two years ago, before the insanity, we had our own lost cat scare. It was during a wild blizzard at the start of January in 2009. Unbeknownst to us, The Cat had gotten out sometime during the night. When my practically husband couldn’t find him anywhere in the house in the morning, he immediately began to worry. It was freezing outside, one of the coldest days we’ve had since moving to Nova Scotia. There was snow and wind and ice everywhere. The news warned everyone to stay off the roads. Every time the wind shook the windows of our dining room, I couldn’t help but wince. There was no point in heading out to look for him. The Cat is smart and experienced. He would know to find shelter. Since he wasn’t under the landlord’s dilapidated boat in our back yard, he had to be hiding elsewhere, just waiting for the storm to ease. The Cat also has a full, double-coat. If I had to guess his breed, I would say he must be part Siberian. He’s tough and brave. I did my best to reassure my husband The Cat would return eventually. It just may take him a little while. Obviously, our fuzzy orange kitty did return eventually. I will never forget hearing that first meow as he re-entered the house. It had been a long and trying afternoon of trying to take our mind off things by watching a Trauma: Life in the E.R. marathon on television. Seeing him again, knowing he was alive, was an amazing feeling. I knew how close we had come to losing him for good. Growing up, my childhood dog, Nikita, was an expert escape artist. No matter how high the fence or how strong the latch, she would find a way to break out. We didn’t have a micro-chip, back then I don’t know if anybody did. All she had was a license and a little tag with her name and phone number. That cheap plastic tag was often the only way we were ever able to find her again. Sometimes she just went to the end of the block to hang out with her co-Siberian husky around the corner. Sometimes she ended up at the shelter. My parents tell a funny story, funny because it ended well, of the time when Nikita ran away just days after we had moved across the country. Her tag was useless as it still had our old phone number – this was also long before cell phones. Her license was useless because it was still her old one from Burlington. The only thing that saved her was her rabies tag. The wonderfully kind woman who found Nikita, called the vet’s phone number listed on the back, long-distance. Of course our former vet had no idea how to contact us but he did know my father’s sister, as it happens. So he called her and she was able to find our new number and contact us. But for the kindness of strangers, where would we be? If I see Megatron, I will do my best to return him home safely. It’s a task all animal lovers accept without complaint. But hopefully I won’t. Hopefully he is already back where he belongs among the company of those who love him best. I always feel sad whenever I see a poster like this. What’s worse, when it’s a cat poster I feel like there’s an even smaller chance that the cat will be found. So many people let their cats outdoors (which I don’t like) that it’s hard to tell which cats have a “home” but are just outside, and which ones are truly lost. Last year we actually came across a cat in our yard that I wanted to keep as our own, but T convinced me that the cat probably did have a “home” and was just let outdoors. Part of me still wishes we had kept him. I hope Megatron is back home safe and sound soon. You are right. Last year there was a cat that took to hanging around our back door. He was so sweet and friendly that I thought it must have had a home. I was reluctant to call animal control because I would hate to think his owner was looking for him. If we could have taken him in at the time, I would have. Fortunately, our next door neighbours brought him to the SPCA and paid for his admission. Hopefully he is living in a wonderful home right now. I hate seeing posters like that. They make me feel so sad and scared for the poor lost animal. For some reason, I think seeing ones for dogs is worse because cats seem resilient to me, but dogs not so much. Or maybe just my dogs. Agh, now I’m thinking about Chai getting lost and my heart, it is broken. Here’s hoping we never have to put up signs like that ever. Course, Chai and Mak are both outfitted with: a rabies tag, a personalized tag with name and number, a microchip with name and number, and a BlanketID tag with serial number to find owner. I may have gone a little overboard. It is harder for dogs, I think. That’s why I am glad I don’t see very many of those posters. They rely so much more on humans for all their basic needs. The idea is definitely heart breaking. I can’t think of either of my pets being lost or taken from me somehow without tearing up. Overboard? Maybe. But it’s better to be over than under, right? More than anything, that personalised tag with the phone number is so vital. It is what returned my childhood dog to us more times than I can count. Without that tag… I don’t want to think about it. Its heart breaking when your loved pets go walk about, our last dog did, but a kind person got him back to me. I am so glad your dog was returned! The kindness of strangers in times like these just takes my breath away. I sincerely hope Megatron is already home safe as well. It’s such a sad thing to see those posters – and you’re right, they are mostly of cats. I haven’t seen a dog poster in a long time (which is good news, I suppose). This is a beautiful post, thanks for sharing. It’s so sad when our fur babies go missing. Sure hope the cat goes home. It’s hearbreaking, losing a family member. I hope the kitty makes it’s way home TODAY! Had a husky once and loved her but never again. They’re all reincarnations of Houdini! I know this to be true! Several years ago I lost my heart dog, Louie, in the dark cold of winter. Though I had a dog detective and people who swore they saw him, he was never found and I am sure he is with God. i’m just going to buck the trend here and say – what a great story about nikita! and of course, i do hope the kitty comes home. a good friend’s mum in france lost her 2 cats – one last year, the other just recently. remus and romulus, gone missing and presumed dead. my friend tells me they had very unusual coats. i’m not sure what she means by that, but it made me think of cruella. My mom says she gets a sick feeling every time she sees one of those posters. She can’t help but worry abouts the dog or kitteh that has gone missing or put herself in the place of the owners who must be worried to death. She honestly can’t imagine anything worse than the “not knowing” part. So we all have abouts a million kinds of identifications. We all have collars with tags on them and we are all microchipped. (Even the kittehs even though they don’t go outside.) Me and Brudder Ranger also have our everyday collars that have our names and phone number sewn into them. Mom figures that that way, if we got out and we were to skeered to go up to somebuddy, maybe they could make out the phone number on the collar to call. Yep…it’s a fact. The woman is totally and completely paranoid! I sure hope Megatron finds his way home. It is a scary thing when a beloved pet disappears. Hopefully most folks today have microchips as well as tags to increase the likelihood of a safe return. It always makes me sad to see those posters. Especially this time of year and when it’s cold and miserable out. I hope he finds his way home soon! I like your addition to the sign. That positive push may help that cat find the right steps home. I cannot imagine going through a night like you had to go through with your almost husband when the cat was out in cold weather like that. Ugh. I often think of animals that live in cold climates at this time of year. It gets cold enough in Florida for cause to bring them in, but this is mild cold. The snow and wind for pets to live in all winter long must be horrible. I am glad your cat returned and the dog found her way home all those times. I hope the little fellow finds his way home safely too! It’s Christmas and I hope he can celebrate this day together with his family!!! This is one of our biggest fears. And it always is so hard seeing these types of signs. The hard thing is, sometimes you find dogs and you don’t know what to do. A lot of people don’t even know about microchips. It’s amazing that woman had the foresight to call the vet. I’m glad to see other people read those signs and are on the look out for lost pets. We’ve had the chance to find several lost dogs over the past few years and bring them home to be safe while we hunt down their people. I’ve had to rely on those signs to let people know we found their dog and how to get in touch with us. So keep reading. Maybe you’ll be able to reunite a lost pet and their human. These posters make me so sad- it is the *worst* feeling when a pet is missing. I lost Kayloo for about 10 minutes during a walk and although I was trying to keep my cool I was totally freaking out. I hope Megatron makes it home.